We combined the POD concept with our marketing experience to build a COMPLETE package for everyone looking to start a Personal Online Brand. The discount code doesn't work for the complete package - can you send me a working code? Pm sent with the discount code for the complete package. LIMITED 15%OFF. Ask for the coupon. Not sure how this is related to our service. Today is the ONLY DAY where you can get our complete package for 15% OFF. Offer for 24 hours ONLY! Get yourself ready for Q4 this year with Ecomstarterpack. We're offering a LIMITED 10%OFF. Few spots are still available. Get yours TODAY before the price raises again! After initial payment (I'm heavily considering buying the complete package), how many expenses will there be (sans the money for paid advertising)? Hi Ed and thanks for your interest in our package. 1- Advertising costs (We recommend $300 (at least) to $600 for better results and conversions. 2- The website hosting (if you choose WordPress) or the Shopify monthly subscription. 3- Apparels designs (We recommend updating the products time to time to offer more items to your audience). The designs prices varies depending on the quality from $10 to $50 per design (we can assist you making them or hiring someone to do so). I would estimate the monthly expenses to range from $350 to $500. What does 6 months support mean? Will you actively advertise my website/products to get traffic and sales? Will I need to do any work or everything is done by you and automated?? 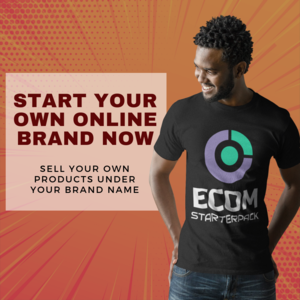 The 6 months support means we will assist you in editing or adding products to your shop, we can also recommend some strategies to market and advertise your products without giving any earnings guarantee, the starter package is mostly about helping our customers starting a POD business online. If you check our offer page you'll find another option called the complete package, in this one we do actually assist you directly in advertising your brand by creating a custom unique video to your site where we talk about how you can profit and scale your business. That includes giving initial audience details along with a detailed documentation on how to run & manage the ads. After we deliver the service we will still be there to answer any question and fix any issue you may have. Use the coupon 10OFF to get a 10% OFF on all orders.